Dr. Hemachandra Gunawardhana hails from the Island Nation of Sri Lanka. He is Board-Certified with the American Board of Psychiatry and Neurology and held numerous positions of responsibility on the hospital staffs he served and has a tremendous amount of experience in the practice of Psychiatry. Dr. Hana is a member of the American Medical Association. He was elected a Fellow of the American Psychiatric Association in 1995. He is a consultant psychiatrist at Summit Ridge Hospital in Lawrenceville, GA and works in the E.C.T Dept in there as well. 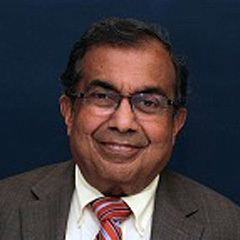 After his education and graduation from Faculty of Medicine University School in Colombo, Sri Lanka, he and his family immigrated to the United States for higher studies. He completed a carrier residency program in Psychiatry at the Missouri Institute in St. Louis, Missouri. He was in private practice in Missouri in the metropolitan St. Louis area and moved to Atlanta in October 2010 to be closer to his extended family. Dr. Hana received an award for Distinguished Life Fellow in 2005 in recognition of his service to the public and psychiatric community. He serves as a Consultant at Summit Ridge Hospital in Lawrenceville, GA and at Ridgeview Institute in Smyrna, GA for inpatient care. He serves as Chief of Psychiatry from St. Elizabeth Hospital in Granite City, Illinois for 12 years.